H.E. Governor Wycliffe Ambetsa Oparanya gave this year’s Kenya Certificate of Primary Education (KCPE) victors, their parents, school directors and teachers audience at the county headquarters today following a spate of good performance by last year’s candidates from Kakamega County. 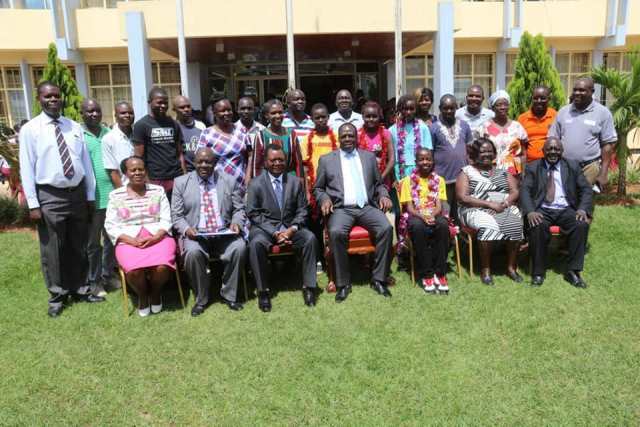 Governor Oparanya accompanied by his deputy Prof. Philip Museve Kutima and the CECM for Education, Science and Technology, Mr. Joseph Indire cited past best performers including Sharon Rotich and Wilson Nyabocha of Hill School Academy who scored 437 marks in 2014; Aggrey Khanyinya of St. Joseph’s Academy who scored 449 marks in 2015; Victor Oduor 437 marks in 2016 and Godalyn Kakuya of St. Ann Junior Academy, Lubao, who scored 455 marks in 2017. These students were ahead of the pack countrywide. “I wish to commend all education stakeholders for taking advantage of the enabling environment provided by the county government to ensure that our children receive the best possible tuition to achieve their dream results,” he said. He revealed that over the past 5 years the county government had spent Shs 2 billion on improvement of infrastructure in schools, school building projects, ECDE Centres, centres of excellence and scholarships for top students, two per sub county, to pursue degree programmes abroad in the field of medicine and engineering. He added that 550 secondary school teachers have been recruited to close gaps in staffing levels in various schools in the county. In the recently announced KCPE results, Rawlings Aketch Odhiambo of Hill School tied with Olive Wachira of Nairobi on 453 marks to emerge as the best top joint candidate. In attendance were CECMs, the County Secretary, Madam Jacinta Odhiambo, Chief Officers, Advisors, among many other senior staff.